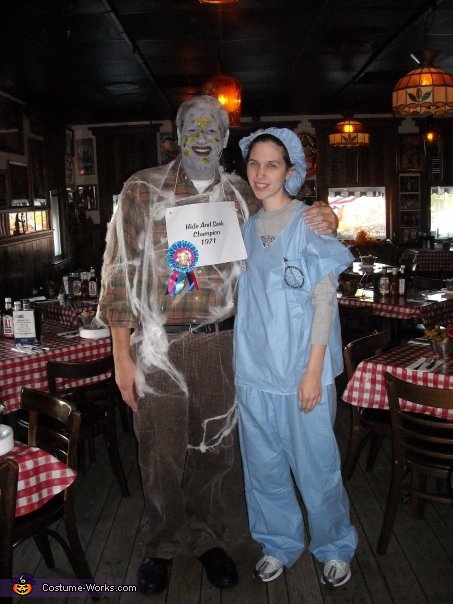 This homemade costume for men entered our 2011 Halloween Costume Contest, and won 3rd place in the Most Creative Costume nomination! I got the idea from the old joke: "What do you call the dead blonde in the closet? Hide and seek champion 1971!" I took it and made it real. I made myself up and dressed like a guy who was playing hide and seek in 1971 and never made it out. I guess that makes him the champion.. This is a great costume. So original and it looks as though it took a lot of thought and work. Good job! Love it! Keep em coming, dude! Hope you win and make some moolah! Do you have any other ones from past Halloweens? Wonderful costume! Hope. You win it. What's the green stuff you used? I want! !!!! !